From traditional beauty to a modern refined look, Quadra-Fire fireplaces showcase stunning style to fit any taste. Combining style and efficiency, our fireplaces are complete heating solutions as well as stunning home accents. When looking for high-performance, wood burning fireplaces from Quadra-Fire offer hassle-free convenience and comforting warmth you can enjoy daily. Featuring extended burn times, enthralling natural flames and exceptional quality, Quadra-Fire systems are truly the best in the industry. 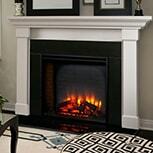 Add a healthy dose of ambiance and an alluring glow to your home with new, efficient fireplace. 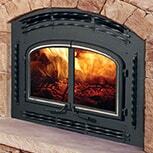 Electric fireplaces from Quadra-Fire provide powerful heating that works as soon as you plug them in. These beautiful fireplaces provide a fantastic option where traditional fireplaces simply won’t work. Transform your outdoor space into a relaxing retreat with one of our beautifully crafted Quadra-Fire fireplaces. 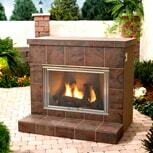 Outdoor heating systems provided added living space to enjoy while adding significant value to any home.